Why choose the Uplinx Provisioning System? The Uplinx Provisioning System has been designed from the ground up to efficiently and effectively service MACD requests within an Enterprise. Uplinx has concentrated on delivering a system specialising in servicing MACDs as these requests represent over 90% of changes made on working Cisco and Microsoft UC environments. By focusing on this requirement, Uplinx has been able to deliver a system that can be easily fine-tuned to provide a simple and centralised interface that allows for user data to be provisioned across multiple UC servers correctly and successfully, first time, every time. Our simple operator console reduces the complexities generally associated with provisioning user information across multiple Cisco and Microsoft UC servers. By simplifying the provisioning interface, our system lends itself to allowing non-skilled UC staff to service MACD request, leaving skilled Cisco UC staff to concentrate on more complex tasks. How does the Uplinx Provisioning System compare to Cisco Prime Collaboration? A fully automated provisioning system based on Extension Mobility and defining an LDAP source such as Microsoft Active Directory as the source of truth for user data. Any changes to user contact information in the LDAP source will trigger an automatic update to the appropriate UC servers. A centralised console where operators do not need to make decisions but populate a few select fields on a single console screen and then press the submit button for the MACD to be actioned. Data is sourced from LDAP sources and used to pre-populate fields. Any operator data fields can be validated by the Provisioning system engine to ensure they are correct prior to processing. A non-synced system that does not require a migration strategy, no import of data and no master/slave architecture enforcing changes through its own interface. Our stateless design keeps all data on the primary servers such as CUCM or Microsoft Active Directory and allows you to update data received from such systems in any way. No sync state is present - hence there is no need to build redundancy into the system. If a failure does occur MACDs can still be performed directly on the primary servers. For example, users with phones can be added on CUCM by the provisioning system, then manually modified on CUCM and then again updated via the Uplinx Console. Support of multiple clusters and locations. Cisco Prime Collaboration is an excellent tool for enforcing standards across all configuration items associated with a Cisco UC deployment. However, this comes at a cost with rigid rules and defined workflows that may not necessarily fit into an organisations existing service desk workflows. The complexities of configuring Cisco Prime Collaboration generally mean that the installation itself becomes a rather large and costly project. In contrast, the Uplinx Provisioning System can provide a flexible and simplified interface for supporting MACDs as this is all the system concentrates on. Installation is straight forward and Uplinx provide help during the installation phase as part of the purchase cost of the software. 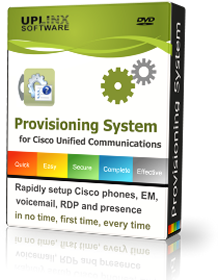 Why purchase the Uplinx Provisioning System when Cisco Prime Collaboration is free? Although Cisco UC 10 and upwards includes Cisco Prime Collaboration Standard when purchasing Cisco Unified Workspace Licensing and Cisco User Connect Licensing, annual maintenance and support needs to be purchased for Cisco Prime Collaboration Standard. In conjunction with the maintenance, the complexities of configuring Prime to work within an Enterprise environment lends itself to being deployed as a project piece of work. Cisco Prime Collaboration standard also only supports a single cluster. With the Uplinx Provisioning System, the year one pricing includes annual maintenance and software support as well as installation support. Installation typically takes several days along with some prior collaboration sessions to agree on how the Provisioning System will integrate with the end customer's existing MACD processes. The Uplinx Provisioning system is very flexible on how information is presented to the operators charged with servicing UC MACDs. Back end configuration templates make the Uplinx Provisioning System very easy to configure and new site support can be configured in hours. The Uplinx Provisioning system is licenced based on the number of end devices that need to be supported across any number of clusters. The Uplinx Provisioning System also supports Microsoft Lync and Exchange and leverages data contained in Active Directory.